Andrea is currently accepting new and transfer students ages 3 and up in Suzuki violin and viola. Register for Suzuki violin and viola lessons now! Suzuki ECE classes will be held beginning Fall of 2019. Register now to reserve your spot! Andrea Coyle’s Violin & Viola Studio, LLC is committed to offering quality Suzuki violin and viola lessons in Denver, Colorado. Students range in age from three to adult and are currently studying Pre-Twinkle through Suzuki Book 6. In addition to the Suzuki repertoire, I supplement with fiddle music, other classical music, movie music, and popular tunes. Currently the studio is made up of roughly 50% pre-school and elementary students and 50% middle school, high school and adult students. Successful students are committed to attending weekly private lessons, group classes and recitals, practice daily, and listen to their recording daily. In our Suzuki lessons please expect to work on character development in addition to skills on the violin or viola. Students should leave the studio with a mastery of their instrument and excellent character skills such as commitment, responsibility, discipline, focus, and a caring attitude. Check out our Studio Spotlight for student accomplishments! Private lessons are scheduled Mondays through Thursdays. Group classes are scheduled September through May. Daytime and after school lessons are available. I am currently accepting both new beginners and transfer students.Andrea Coyle’s Violin & Viola Studio is committed to offering quality Suzuki violin and viola lessons in Denver, Colorado. Students range in age from three to adult and are currently studying Pre-Twinkle through Suzuki Book 5. Successful students are committed to attending weekly private lessons, group classes and recitals, practice daily, and listen to their recording daily. In our Suzuki lessons please expect to work on character development in addition to skills on the violin or viola. Students should leave the studio with a mastery of their instrument and excellent character skills such as commitment, responsibility, discipline, focus, and a caring attitude. Check out our Studio Spotlight for student accomplishments! Private lessons are scheduled Mondays through Thursdays. Daytime and after school lessons are available. Andrea Coyle is a performer and teacher of violin and viola in the Denver area. She has a passion for teaching students of all ages in both private and group settings. During her 5+ years of teaching she has fully adopted the Suzuki motto ‘To Learn with Love.’ Andrea Coyle is an active member of SAC and SAA where she enjoys leading performances and presenting topics of interest. Each year she teaches repertoire classes and leads play-ins at the SAC Fall Festival. In 2017 she enjoyed teaching a well attended fiddle workshop at the O.D.C.P. Funfest in Evart Michigan. She currently serves as secretary on the Suzuki Association of Colorado board. She is a registered Suzuki Violin teacher in Books 1 through 8. In addition to her primary Suzuki training, Andrea has completed ECE 101 and 103, Every Child Can!, Teaching Note Reading with Ease and Accuracy, Note Reading: A Suzuki Approach: Cello & Violin, Practicum, and Track 4 String Teachers at the Rolland Fiddle Camp. Andrea Coyle is currently a member of the viola section of the Evergreen Chamber Orchestra. She has held the positions of principal violist of the Boulder Symphony working under the direction of Devin Patrick Hughes and principal violist of the Flatirons Orchestra. She has attended numerous summer festivals including Brevard Music Center, Green Mountain Chamber Music Festival, Interlochen Fine Arts Camp, Rocky Ridge Music Center, and Blue Lake Fine Arts Camp. She earned her Masters of Music in viola performance, as well as a Certificate in Suzuki Violin Pedagogy from the University of Denver. Andrea Coyle also attended the University of Colorado at Boulder and North Carolina School of the arts. Her primary teachers included Basil Vendryes, Erika Eckert, and Sheila Browne. She is committed to life long learning. Andrea is committed to furthering her education; frequently attending conferences and workshops in addition to her daily reading, practice, and research. When not performing or teaching, Andrea Coyle spends her time enjoying the outdoors, art, games, and reading. She also owns a quilt shop called Happy Squirrel Quilts and runs a small Etsy shop called Dicey Situation. She currently lives in Denver with her husband Nick and their cat Éowyn.Andrea Coyle is a performer and teacher of violin and viola in the Denver area. She has a passion for teaching students of all ages in both private and group settings. During her 5+ years of teaching she has fully adopted the Suzuki motto ‘To Learn with Love.’ Andrea Coyle is an active member of SAC, SAA, and ASTA where she enjoys leading performances and presenting topics of interest. Most recently she taught the violin and viola group classes and lead the viola play in at the SAC Fall Festival. In 2017 she enjoyed teaching a well attended fiddle workshop at the O.D.C.P. Funfest in Evart Michigan. She currently serves as secretary on the Suzuki Association of Colorado board. She is a registered Suzuki Violin teacher in Books 1 through 8. In addition to her primary Suzuki training, Andrea has completed ECE 101 and 103, Every Child Can!, Teaching Note Reading with Ease and Accuracy, Note Reading: A Suzuki Approach: Cello & Violin, Practicum, and Track 4 String Teachers at the Rolland Fiddle Camp. 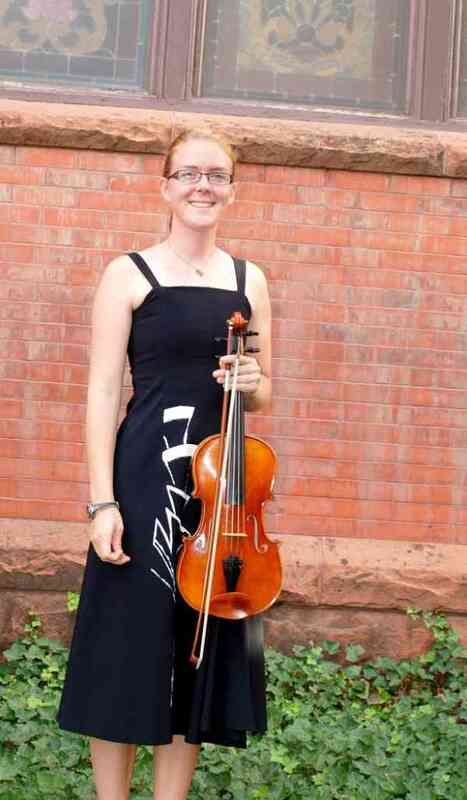 Andrea Coyle is currently a member of the viola section of the Evergreen Chamber Orchestra. She has held the positions of principal violist of the Boulder Symphony working under the direction of Devin Patrick Hughes and principal violist of the Flatirons Orchestra. She has attended numerous summer festivals including Brevard Music Center, Green Mountain Chamber Music Festival, Interlochen Fine Arts Camp, Rocky Ridge Music Center, and Blue Lake Fine Arts Camp. She earned her Masters of Music in viola performance, as well as a Certificate in Suzuki Violin Pedagogy from the University of Denver. Andrea Coyle also attended the University of Colorado at Boulder and North Carolina School of the arts. Her primary teachers included Basil Vendryes, Erika Eckert, and Sheila Browne. She is committed to life long learning. Andrea is committed to furthering her education; frequently attending conferences and workshops in addition to her daily reading, practice, and research. When not performing or teaching, Andrea Coyle spends her time enjoying the outdoors, art, games, and reading. She also owns a quilt shop called Happy Squirrel Quilts and runs a small Etsy shop called Dicey Situation. She currently lives in Denver with her husband Nick and their cat Éowyn.